Rajasthan is known for its Mehmannavazi or hosting. People here treat their hosts as Royal Guests. They are proud of their heritage and will tell you about it with pride and show you around as much as they can. While experiencing this sort of hosting in Udaipur where they treated a poor backpacker like me with so much respect and love that made me wish I could spend a few more days over there. But as they say a traveler must move on. My next destination was waiting. Tip: Never choose a private bus in Rajasthan, the government buses are very well managed and timely compared to these rickety pieces of metals. I reached Jodhpur in a rickety bus, the seat was broken, the AC didn’t work and yet the ticket price was way more compared to a government bus. The mentioned backpackers from Belgium I met in Udaipur, those poor souls accompanied me in this bus as well. For two tall Europeans they had to go through a lot in the last seat of the bus with limited leg room. Jodhpur is a glorious city. The views of blue city in morning and the lightings in night are something that one simply cannot miss watching. 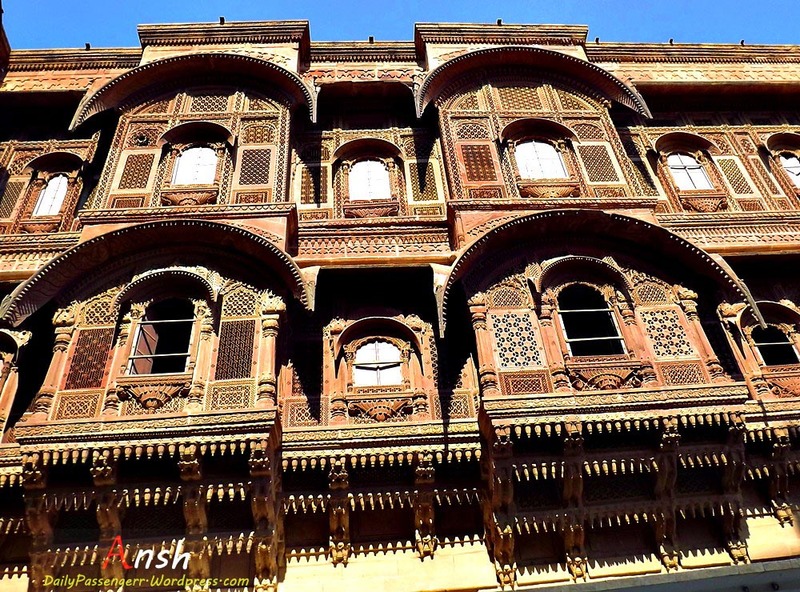 Jodhpur is divided in two parts, new city that is a fast developing urban city and the old or the walled city that is divided into a number of gates and is the center point of the fading blue city. “Once there was a very powerful king who wished to build a grand fort facing his city and protecting it. After a long search for perfect location he came across the hill and immediately ordered his men to clear the land and make a fort watching over his city. Only one man lived there, known as Chidiyawale baba among the locals. The holy saint who used to feed the birds and talk to them was so furious when asked to be evicted that he cursed the king with drought to his kingdom. Afraid, the king went to Baba asking him for forgiveness. Baba told him that only way this drought can be avoided is if someone willingly sacrifices themselves for their land that too only by being buried alive. 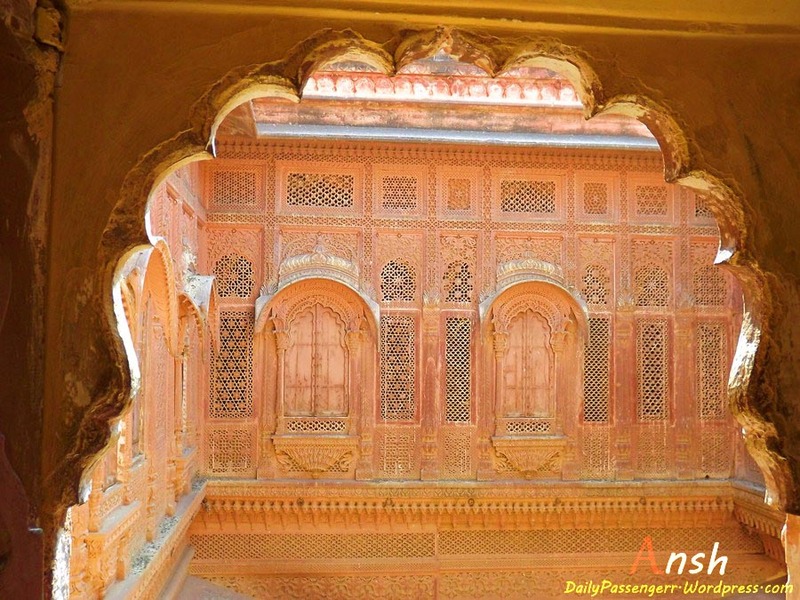 Entering Mehrangarh fort is not an easy task, especially if you are a backpacker from foreign land. The heavy charges include compulsory audio guide and ticket prices. I met my friends from Belgium taking views of the city from the wall. This was the first time I got into a convo with them and this time they were not in a good mood. Obviously someone traveling on this tight budget won’t be pleased. I am sure they must be heartbroken to know the entrance fee that they couldn’t afford. It was the Royal Palace of Udaipur all over again. As far as story goes, I wondered if Meghwal’s sacrifice was painless as they say but I couldn’t find much detail about this anywhere. Not only this but this story is not mentioned in any of the guidebooks. 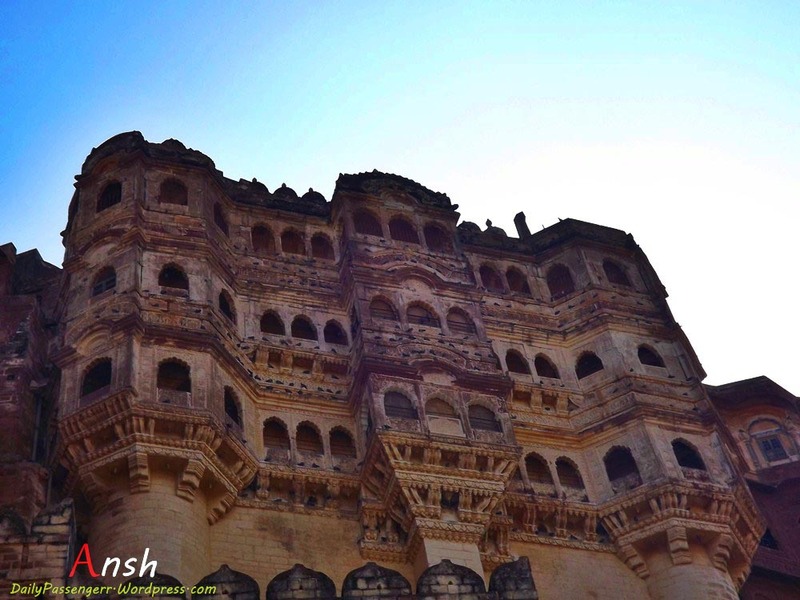 What I know is that Mehrangarh Fort is a unique example of architecture and grandness. 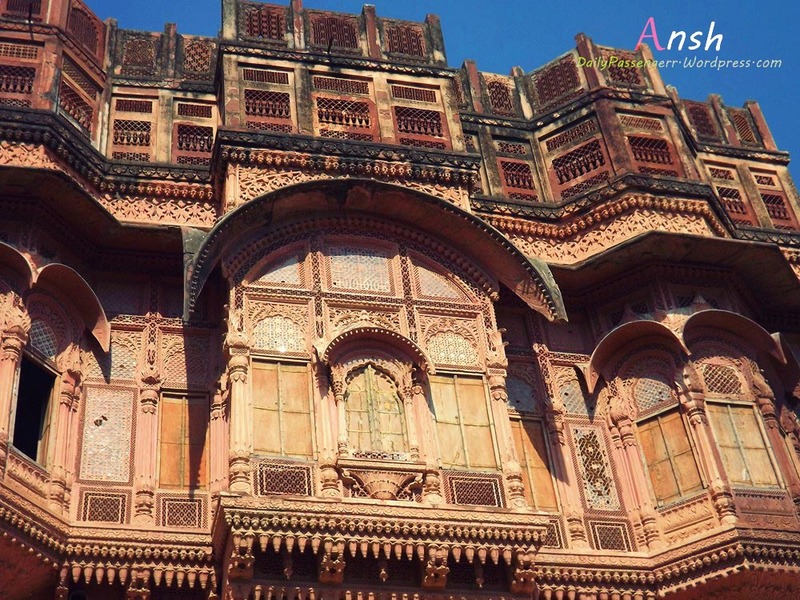 Mehrangarh fort has an imposing view from Jodhpur city that looks high above from the hillock on which it is built. 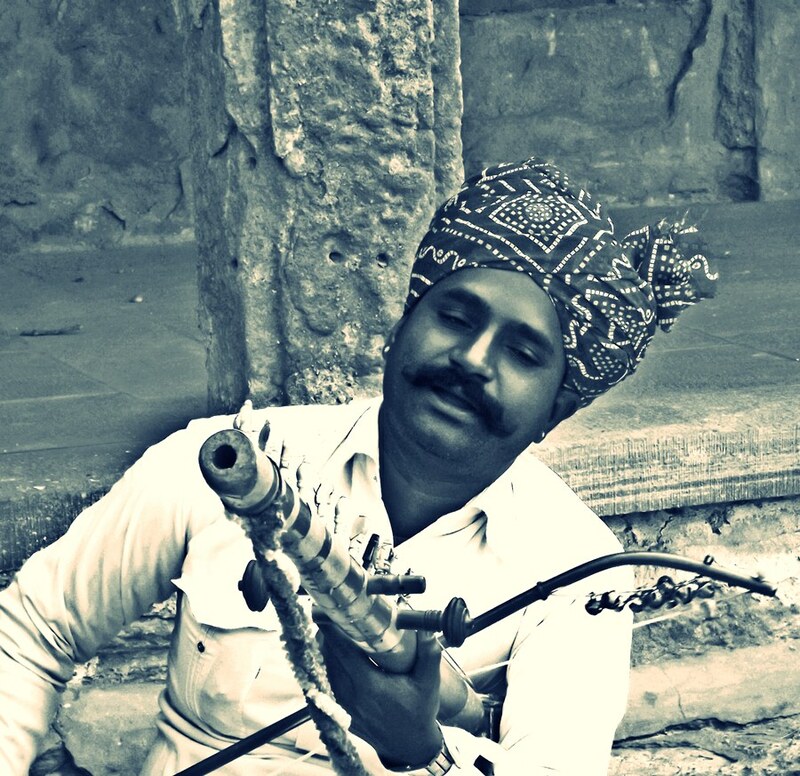 The city was the center point of Rathore Clan that flourished around the fort. Mehrangarh fort is spread across 500 yards and is built in a style that looks like the fort has originated from the hillock itself. Visitors can enter through Jai Pol and go upto the highest point by the lift or simply walk around the fort on foot. 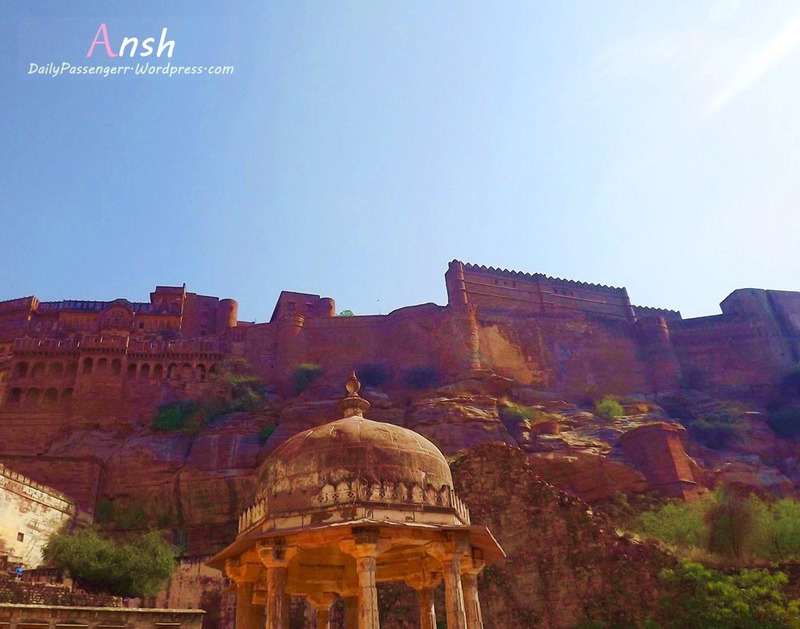 Mehrangarh fort experienced a stampede a few years back that killed a number of people. The accounts of that stampede and what followed after are chilling. They say that there was atleast one dead from every house. The fort comprises of a number of chambers few of them house a number of artifacts and various treasures. Although photography is not allowed in most of these places but these are a treat to the eyes. The beautiful view of blue city from top of the fort is captivating. 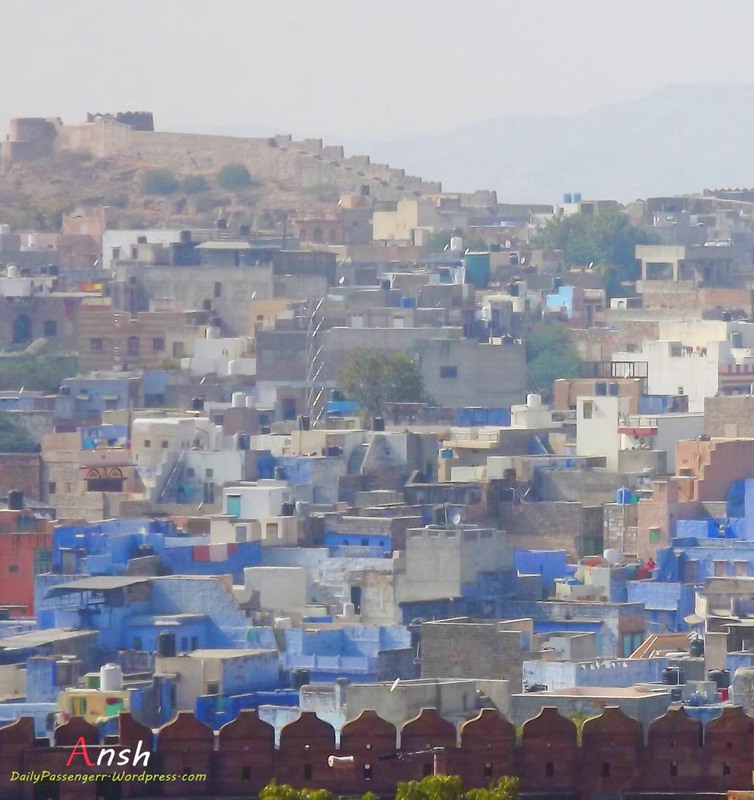 Although slowly diminishing, one can still view parts of it very clearly from top of the fort, at one point this area was known as Brahminpuri and only Brahmins were allowed to paint their houses in blue color. 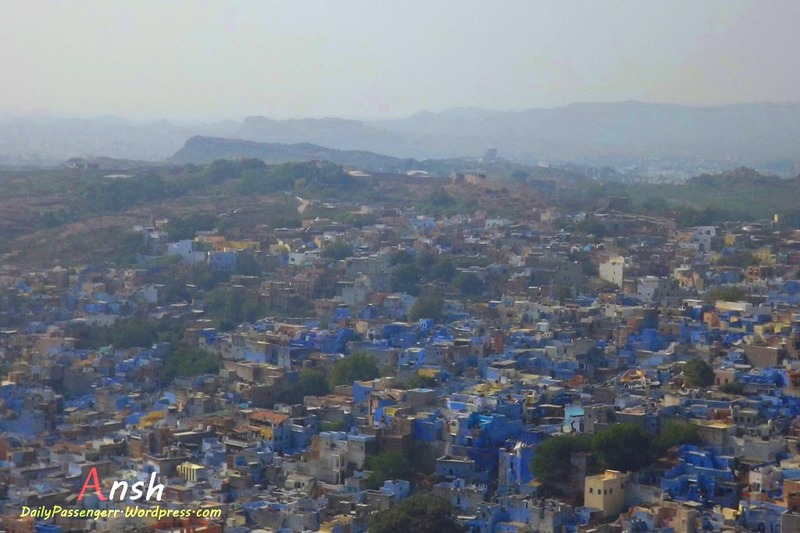 The blue, so characteristic of Jodhpur, is derived from indigo and acts as a heat and mosquito repellant. But as I found out, Mehrangarh Fort doesn’t just offer views of the blue city of Jodhpur; it has a lot of stunning blue to offer within the Fort complex itself. A walk around Mehrangarh fort is an experience of a lifetime. The fort is so huge that only a part is open for common visitors and still walking around the premise takes around 4 to 5 hours. The fort stood in full glory as I left with a number of stories and memories and a promise to return again.